Co. Londonderry and Co. Donegal: Ardmore, Ballymullins (2), Banagher (2), Birdstown, Bond's Glen, Burt, Castle Forward, City and Suburbs (3), Claudy, Fahan, Glendermot, Inch Island, Kilderry, Killea, Lough Enagh, Lower Liberties, Muff, Newtown Cunningham, Upper Liberties, Tamnaheirn, Three Trees, Waterside. The Board also included 9 ex-officio Guardians, making a total of 36. The Guardians met each week on Saturday at noon. The population falling within the Union at the 1831 census had been 65,326 with divisions ranging in size from Inch Island (population 1,068) to Londonderry City and Suburbs (13,750). The new Londonderry Union workhouse was erected in 1839-40 on a six-acre site on the north side of Glendermott Road (now Dungiven Road) at the east of Londonderry. Designed by the Poor Law Commissioners' architect George Wilkinson, the building was based on one of his standard plans to accommodate 800 inmates. Its construction cost £6,780 plus £1,157 for fittings etc. 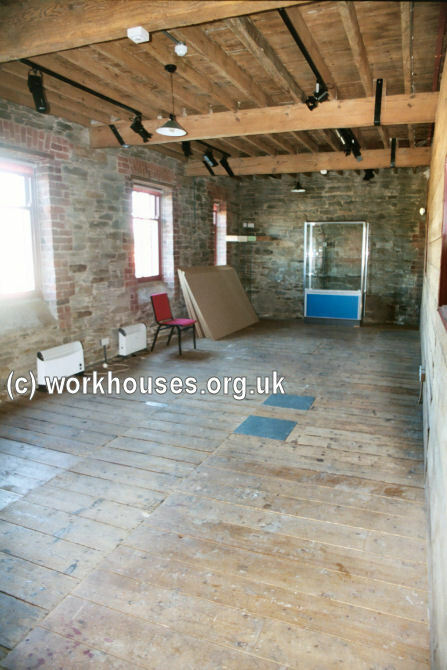 The workhouse was declared fit for the reception of paupers on 10th November 1840 and admitted its first inmates on the same day. Londonderry workhouse site from the south, 2003. The buildings followed Wilkinson's typical layout. An entrance and administrative block at the west contained a porter's room and waiting room at the centre with the Guardians' board room on the first floor above. The entrance doorway is surmounted by an 1840 date-stone. Londonderry entrance block from the south-west, 2003. 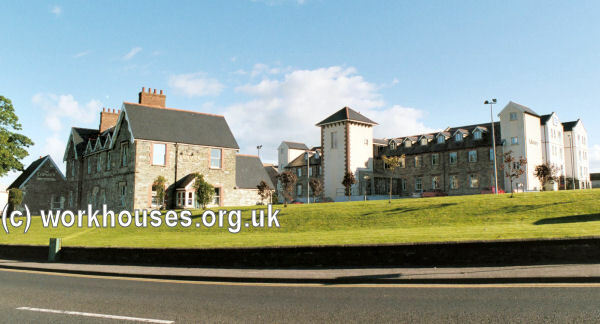 Londonderry main accommodation from the south-west, 2003. 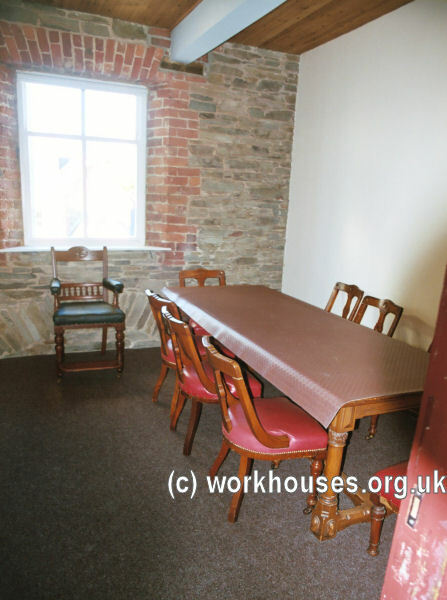 Londonderry workhouse Master's room, 2003. At the top of the main block, children's dormitories were located in the attic space. During the famine in the mid-1840s, a permanent building was erected in the women's yard to accommodate an additional 40 inmates, and temporary sheds erected for 60 fever patients. A fever hospital was subsequently erected at the south of the workhouse. For a period, the workhouse had its own burying ground at the north-east of the site. 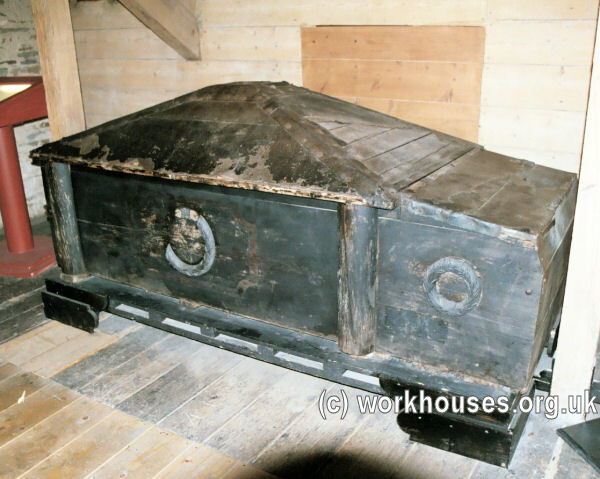 The workhouse had its own "hearse" — effectively an oversized coffin — into which one or more bodies could be placed for transporting to a burial place. A flag would be placed on top when the hearse was occupied to keep people away from a body which might carry disease. In 1895, Londonderry was visited by a "commission" from the British Medical Journal investigating conditions in Irish workhouse infirmaries. Their report itemised a number of deficiencies, especially noting the lack of trained nursing staff, the primitive sanitary facilities, and unsuitable bedding. Further details are available in the full report. At the 1901 census, the population of the Union was 39,892 with 15 officials and 287 inmates in the workhouse. The workhouse site later became Waterside Hospital. The fever hospital was demolished and rebuilt in 1933 but other buildings survived. 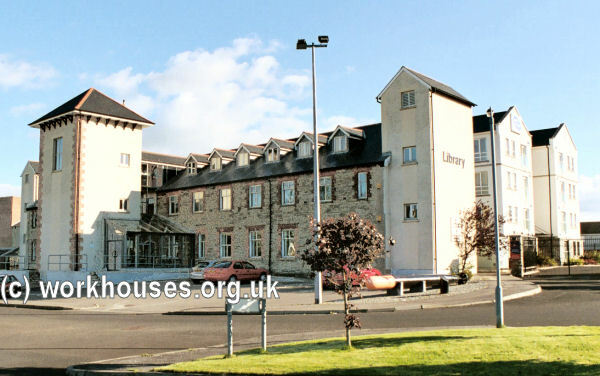 Following the closure of the hospital in around 1990, the main building became home to a library and a museum documenting the workhouse and the great famine. The former entrance block is now used as commercial premises. 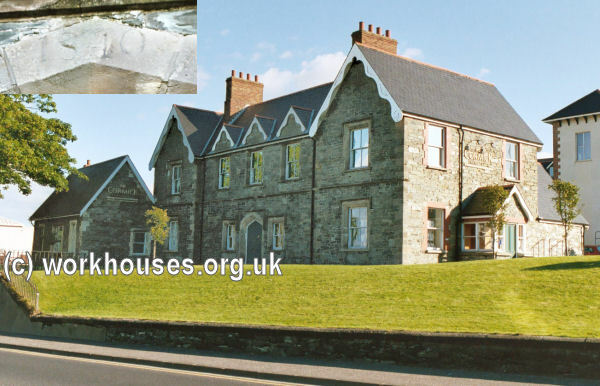 Like a number of other former workhouse sites, the buildings are said to be haunted. One story concerns a particularly strict matron at the workhouse who is said to have fretted herself to death after accidently starving three small boys to death in a punishment cupboard. As punishment for some misdemeanour, the children were to be locked for a few hours in the cupboard which was located in a remote part of the building. Just after placing them there, the matron received news that a relative was ill and went to visit them for a few days, taking the keys of the cupboard with her. On her return she rushed to the black hole, but the children had perished. It is said that the children are to be heard running up and down the top corridor, while the matron haunts the grounds, wringing her hands. Another child ghost is supposed to tug or push at visitors to the building. After the site became a hospital, night nurses often saw a female ghost. One nurse, who herself underwent an operation, awoke to find a woman dressed in white, placing an extra blanket on the bed, before disappearing through the wall of the room. Public Record Office of Northern Ireland, 2 Titanic Boulevard, Titanic Quarter, Belfast BT3 9HQ. Holdings include: Board of Guardians' minutes (1839-1948); Dispensary minutes (1852-99); Indoor registers (1910); Births (1841-1946); etc.